Hey Pretty Girls!! 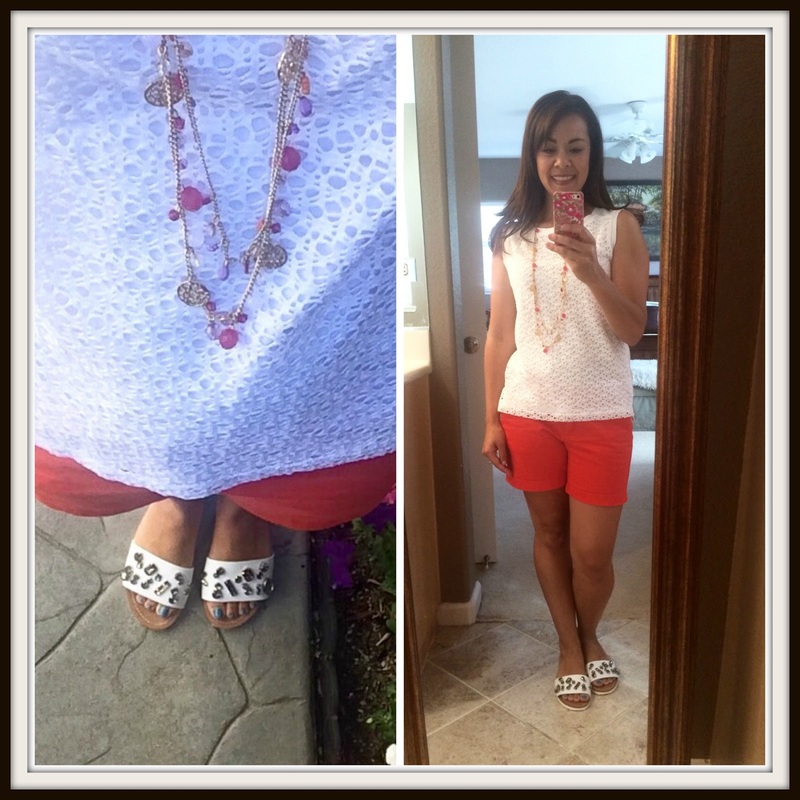 It's July 1st and I'm kicking of an entire month of Lovely Summer Looks with my girls Carrie and Whitney! 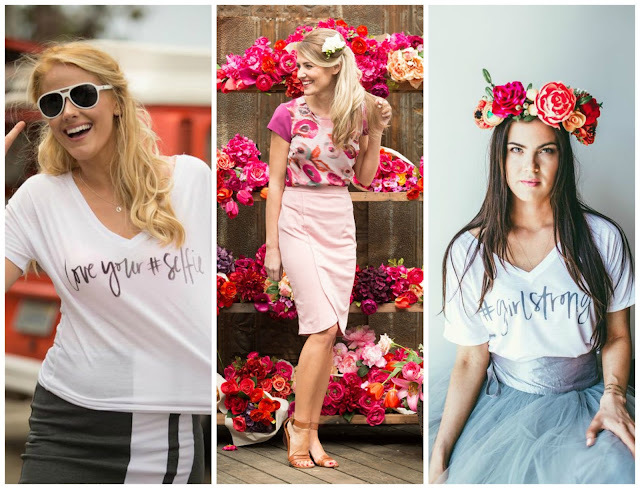 Read about Create28 Lovely Summer Looks HERE. Link up with us every Monday in July or use #Create28SummerLooks on Instagram and play along with us! See the entire month of prompts HERE. I also love the little multi-colored elephant bag charm for summer! 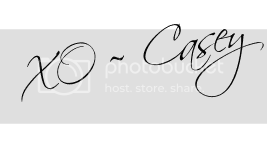 I originally saw it on the Hi, Sugarplum blog and tried to order it several times but it was always sold out! I finally snagged one and I love it-it literally goes with everything! 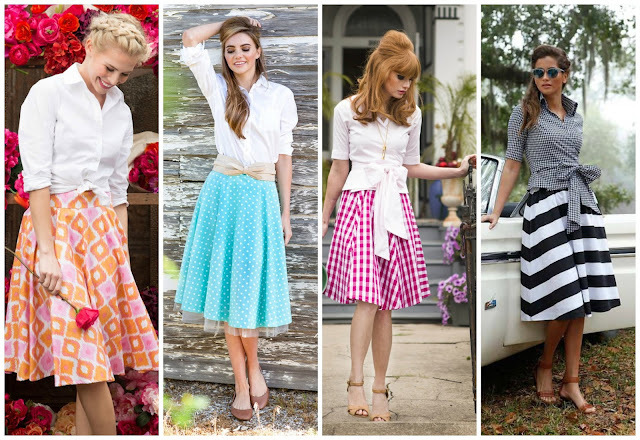 Do you have a go-to summer look or something you love wearing during this time of year? 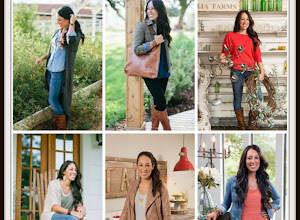 Don't forget to check out my girls Carrie and Whitney and see what their go-to looks are! 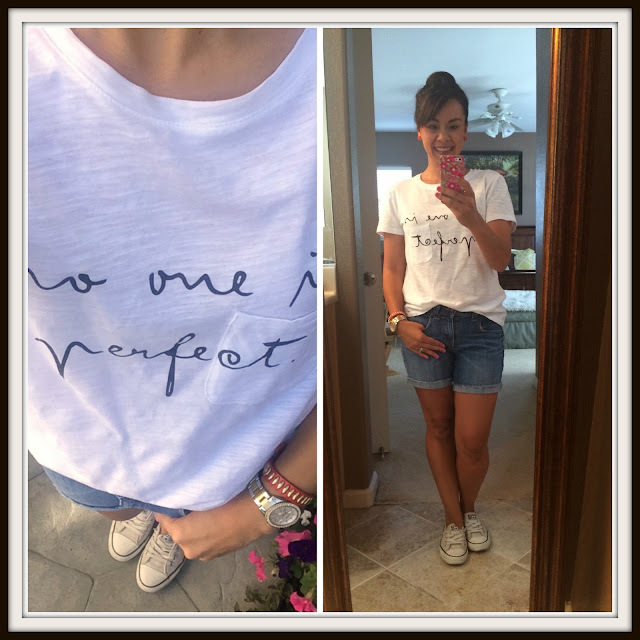 And tomorrow, I will be showcasing Whitney's Graphic Tee look! I'll leave you with my a Pinterest board full of more great summer looks! Enjoy! 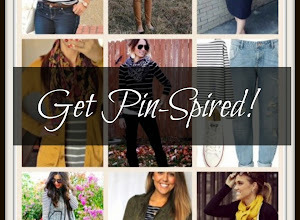 Follow A Little Bit of Cheer's board Summer Go-To Looks on Pinterest. 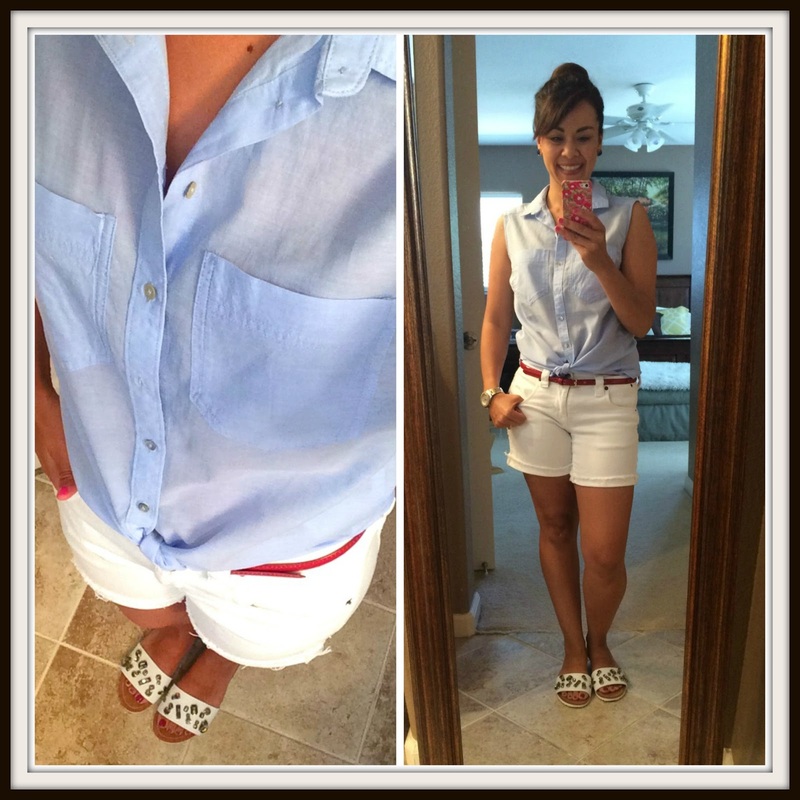 It's Tuesday and I'm recapping last week's favorite outfits from the Summer Challenge--a day early. 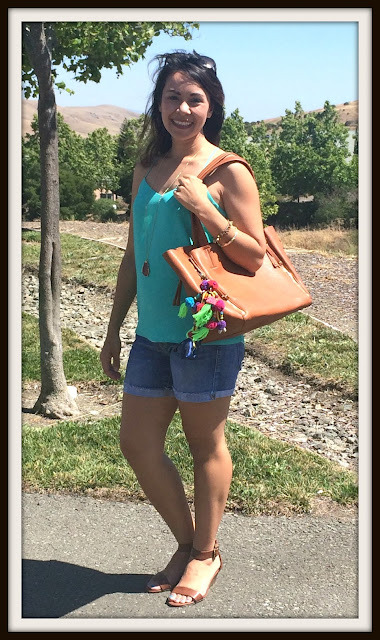 Hope you're ready for some serious summer outfit inspiration....check out all of my blogger bestie's outfits linked below and feel free to link up your favorite outfits, too--the more the merrier!! The link up will open Wednesday at 2am Pacific Time. 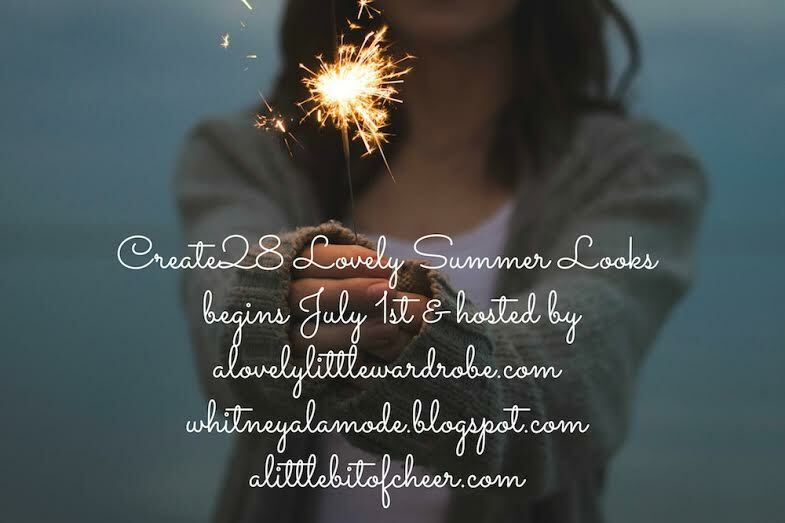 I am posting this recap early because tomorrow, July 1st--Carrie, Whitney and I are starting Create28~ Lovely Summer Looks! Which means every single day in July, I will be posting an outfit created by either Carrie, Whitney or me!!! We'd love for you to play along with us, too! Get the prompts and all the details HERE. 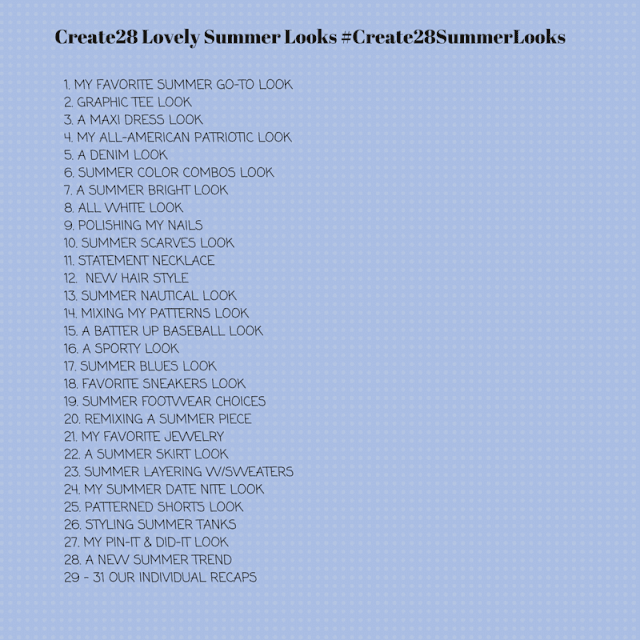 We are so excited to start #Create28SummerLooks! 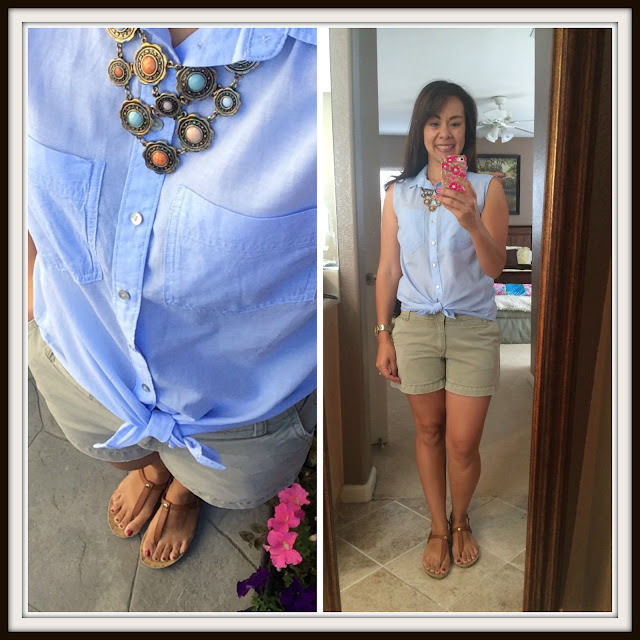 Outfit Formula: Chambray Shirt + Neutral Shorts + Sandals: This outfit was awesome. Just so simple, yet pulled together. It was a little too simple, so I added this amazing necklace my friend got me for my birthday. I thought it complimented the outfit perfectly. Outfit Formula: Lace Tee + Denim Shorts ~ Anytime I can wear this awesome lace tee AND denim shorts is a total win in my book! 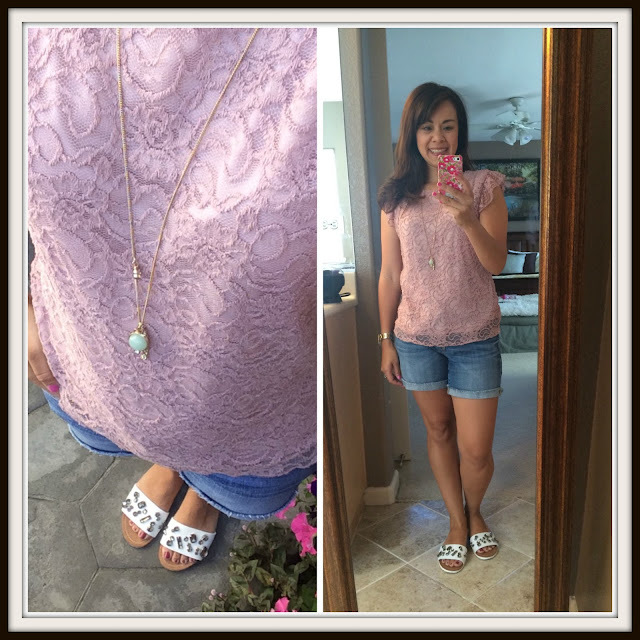 I love lace tees because you really don't need to style them--they speak for themselves! I added a little pendant necklace (again, gifted for my bday..do my friends know me or WHAT??!) just because. Outfit Formula: Kimono + Tee + Shorts ~ OK! So here is a great example of 1) Sometimes you need to go outside your comfort zone and 2) You need to be patient and only buy things you love and that really work! I looked for about a month for a kimono...the struck out probably about 20 times! They were either too long, too short, too "fringy," too bold, too bright, too expensive...I could not find one that spoke to me. FINALLY--at Ross of all places, I found this one for $9.99! I think it's very "me" and I feel comfortable in it, yet it takes me just outside my comfort zone. I love things like that! I can't wait to try it with shorts (it was too chilly on this particular day). 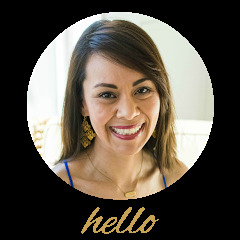 Outfit Formula: White Top + Patterned Shorts + Sandals: I could have gone with my white lace eyelet top here but I'm about ready to throw that thing out the window because wear it so often! 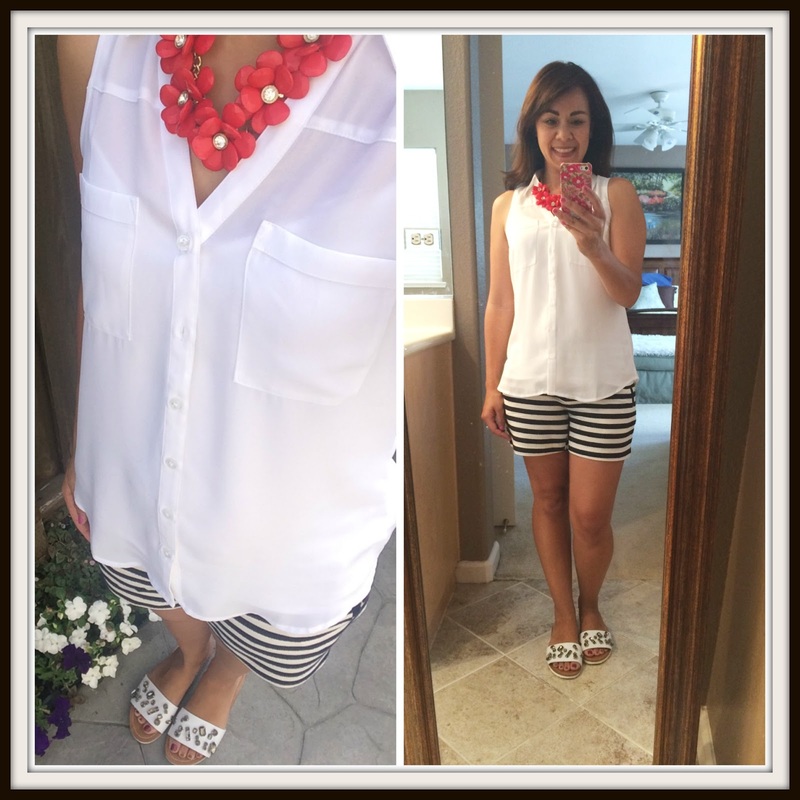 Instead, I paired these striped shorts with a sleeveless Portofino shirt from Express--LOVE these shirts! I literally got a splash of greasy spaghetti sauce on it this day and I FREAKED OUT! But I just sprayed on some Oxiclean and threw it in the wash and it was good as new! :) These shirts wash and wear so easily. 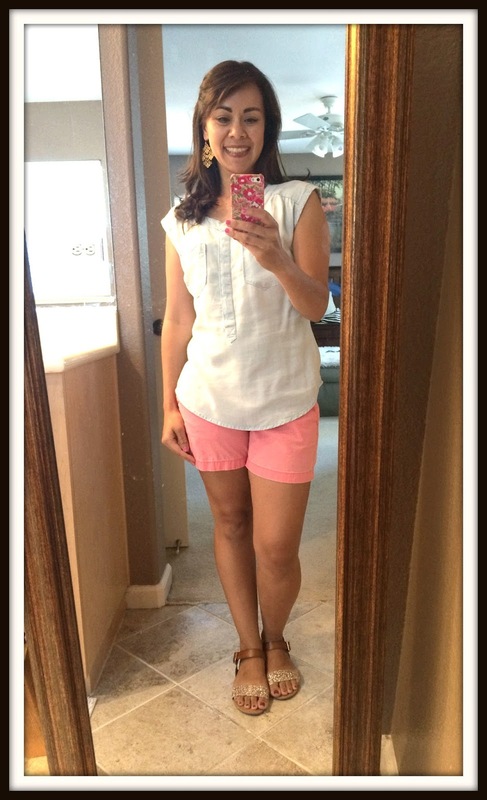 Outfit Formula: Chambray Shirt + Bright Shorts + Sandals + Statement Earrings: You can't see it well in this pic, but my shirt really is a light chambray (not white). I have to say I doubted this outfit to the core. I usually pair chambray with white or another more neutral color but never with bright shorts! But you know, I think it works! Plus, I can't express how much I love this chambray shirt from Target--it is literally the softest shirt EVER! This was a fun week! 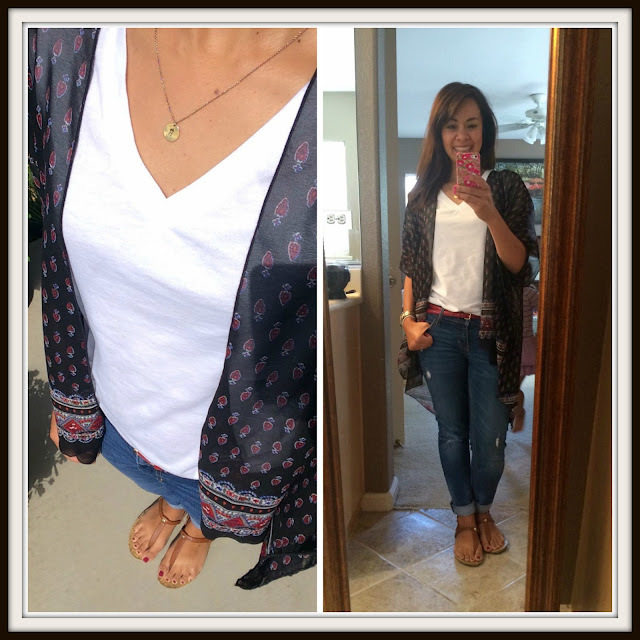 I went out of my comfort zone a bit with the kimono and chambray and brights, but the other outfits were very "me"...or at least my put my "me" spin on the them. :) Next Wednesday will be the last Summer Style Challenge post! I'll be recapping my Top 3 Faves from the 21 Days. See you back here tomorrow as Carrie, Whitney and I started Create28! However, this time I am THRILLED to wear it with skirt from Shabby Apple!! And get this....it's my very FIRST pencil skirt!!! In all of those wardrobe "must have" lists don't they ALWAYS list a pencil skirt??!! I have never invested in one because I just didn't feel I would get enough wear out of it. But when Shabby Apple allowed me to choose an item to review, I decided it was time to try a pencil skirt! Guess what?! I LOOOOVE IT! If I can find a way to dress down a "dressy" item, believe me, I will! 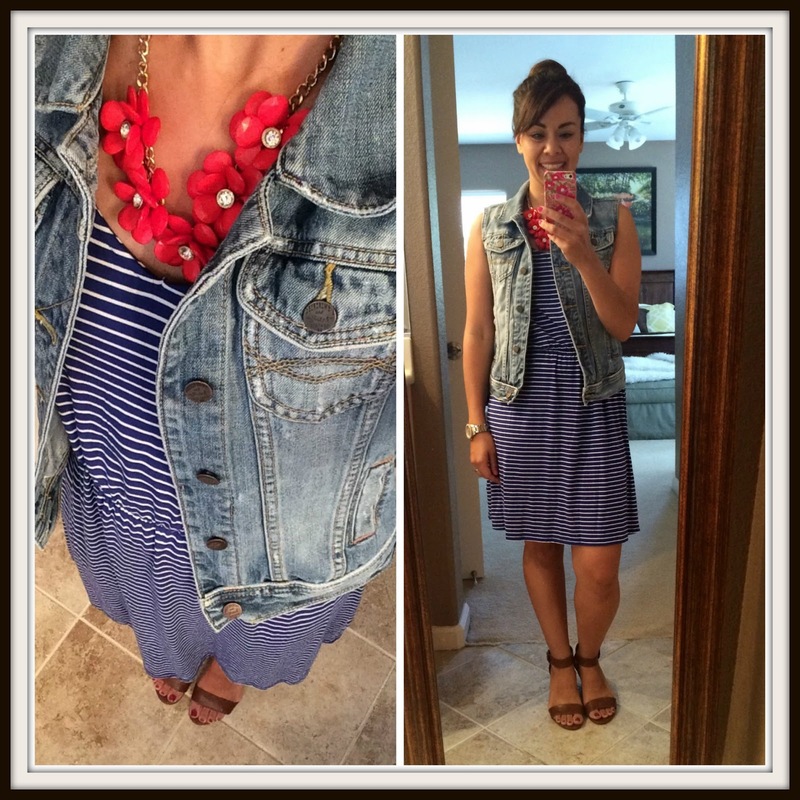 I paired this fancy-pants pencil skirt with my beloved eyelet tank and my "new" DIY'ed denim vest. Have you guys heard of Shabby Apple?? OMG-I am in love with so many of their pieces! They have so many gorgeous skirts and dresses. It literally took me DAYS to decide on what to review. I could have reviewed the entire boutique! Judging by the skirt they sent me, Shabby Apple's quality is top notch! The skirt is fully lined and made of very good quality fabric. I couldn't be happier with it! 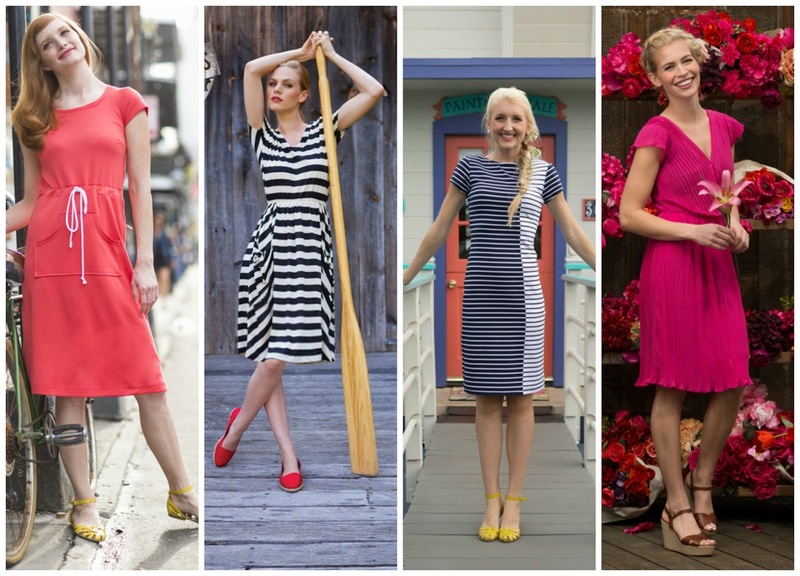 Definitely check out their stuff and use the code FROCKS for free shipping on all dresses and/or the code BUOY for 15% the Sausalito line! Create28 ~ Lovely Summer Looks starts Wednesday!!! You can read all the details HERE. Here is the list of prompts for the entire month--can't wait to see your favorite go-to summer look on Wednesday! Day 1: Sunday ~ Father's Day! We celebrated these two awesome men!! I am truly blessed to have them in my life. 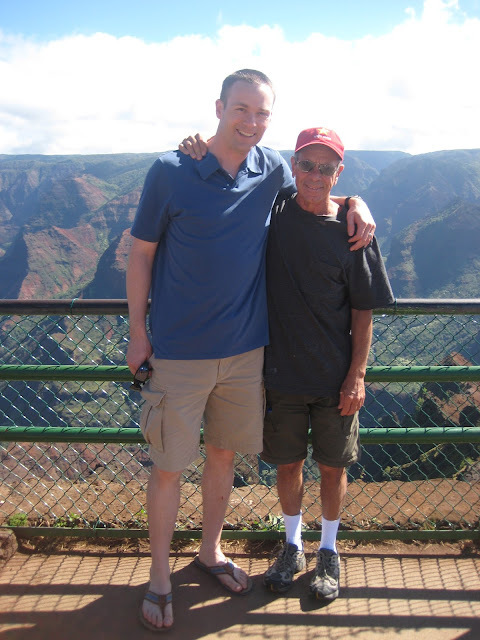 This was taken in Kauai about 7 years ago! We have such good memories from that trip! Day 2: Monday ~ First day of Everest VBS!! They're excited!! This is always such a fun week for the kids and we always end of singing the songs all month/summer/year long! They took pics of all the kids and put them in these cute little frames. Day 3: Tuesday ~ This book was written by one of my friend's hubby's--I started it on Tuesday and I literally cannot put it down! I don't read a whole lot, but I love finding awesome books like this ! Read it!!!! Day 5: Thursday ~ VBS had their ice cream social where the kids sang all their songs. As usual it was ADORABLE. 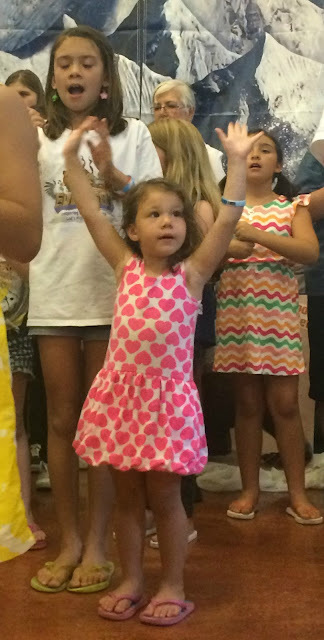 Sarah was too young to participate in VBS, but she had no problem getting up on stage to perform the songs! This kid....! Day 7: Saturday ~ Wine pick up day!!! In Chicago, Scott used to work with Terin, the founder of Bryter Estates...one of our favorite wineries!! Once a quarter, we go to Sonoma to pick up our wine club shipment--they are always soooo nice and so gracious and welcoming to our kids! They have a 'fridge full of kid drinks and a basket full of kid snacks! 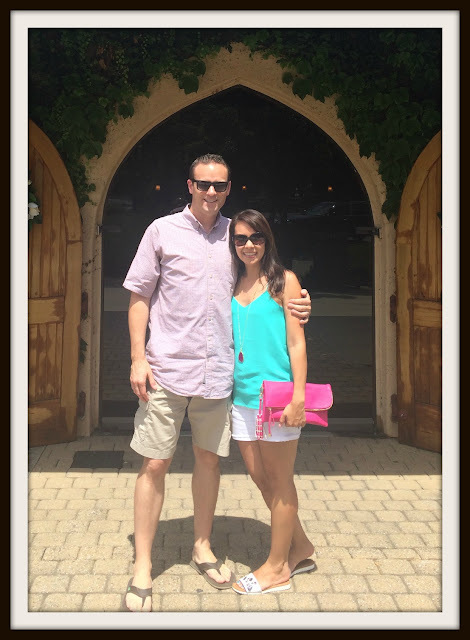 We LOVE Bryter...the people, the tasting room and especially the wine!! AWESOME! Happy Friday!!!! I know I typically do a recipe for Foodie Friday, but Foodie Friday is taking a little hiatus for the next few weeks. As you know, I'll be hosting Create28 ~ Lovely Summer Looks with my gals Carrie and Whitney throughout July, so it will be all summer fashion!! Read about Create28 HERE and please join in the fun!! 1. 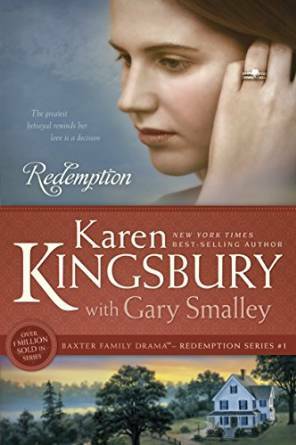 The Redemption Series by Karen Kingsbury ~ My best friend loaned me this entire series and I have to say it rocked my world. Even if you just read the first book, Redemption, I promise you will experience every range of emotion...joy, sadness, bitter, hatred..and possibly forgiveness. The characters and writing by this Christian author keep you enthralled and emotionally involved in every page!! 2. 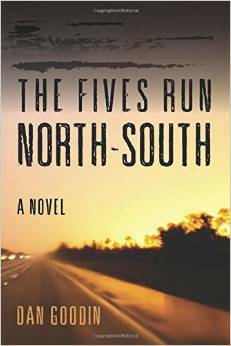 The Fives Run North-South by Dan Goodin ~ Ok, so this one has been on my Kindle for awhile but I haven't had the chance to read anything since the end of the school year!! I just picked it up and now (darn it!!) I can't put it down!! OMG--it is so good...I was reading it last night and I had to force myself to put it down at midnight so I could get some sleep! I guess I will mention it just happens to be written by my good friend's hubby. Geez, I can say I knew them when....! Already has amazing Amazon reviews...i just love finding hidden gems like this one--WOW! 3. 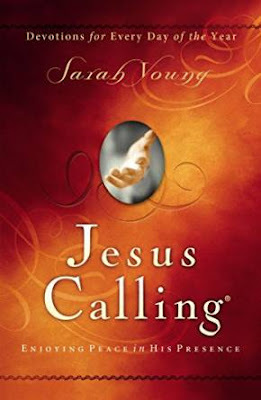 Jesus Calling by Sarah Young ~ I have heard about this book/devotional for awhile now but never purchased it until now. I got it for my mother in law for Mother's Day and she texted me a few weeks later saying it was "life changing." I guess I better get on this one, huh? I have been so busy lately, I have sometimes let my time with God slip a bit. I definitely think reading a little of this book each day will help get me back on track! 4. 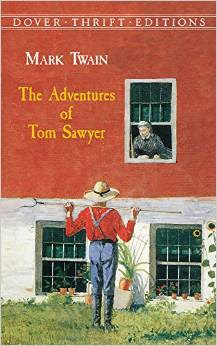 The Adventure of Tom Sawyer by Mark Twain ~ I love reading to Brooke and Will before bed, but it's really rare when I can read a book that they both enjoy. The kids recently "found" this book at our neighborhood "free" library/book swap and boy, has it been a hit!! I read (parts) of this book when I was a kid, but had forgotten a lot of it. They are both at the edges of their beds when I read all about Tom and his adventures with Injun Joe! We are all loving it! It's one of the few books they have BOTH begged me to read more and more!! So that's what's on my reading list this summer--and it's more than enough to keep me busy for a few months!! I can't wait to hear what you all are reading--i am always, always looking for ideas and motivation! Link up or leave you recommendations in the comments--please!! 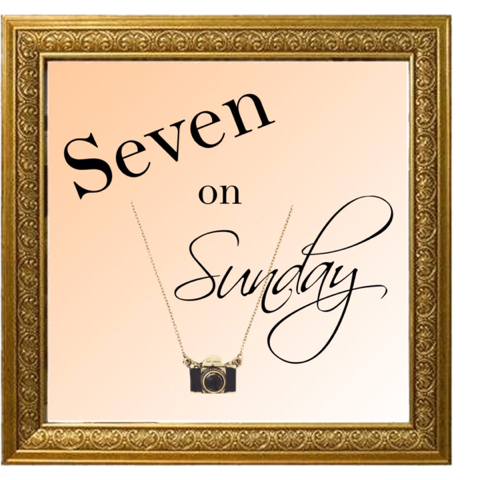 The Summer Challenge Week 2 + Linkup + Giveaway! Happy Hump Day, pretties! Today I'm recapping the first full week of Summer Challenge outfits! Hope you're ready for some serious summer outfit inspiration....check out all of my blogger bestie's outfits linked below, too! Feel free to link up your favorite outfits, too--the more the merrier!! Also, you only have 2 more days to enter to win the $200 gift card to Gap Brands...enter if you haven't already!! I'm not giving up finding a kimono!! Still looking because I think the trend is darling--i just can't find one that looks right on me. In the meantime, I pulled this long cardigan/shrug thing out of my closet. I usually only wear it in the fall/spring, but now I know I can wear it with shorts!! Yay! I LOVE this outfit. It's light, bright and super easy! I chose to wear my white sandals instead of sneakers because I decided I really need to invest in a bright pair of Converse! I'm thinking pink, red or teal...any other suggestions?? Part of this Challenge is also trying new things with your hair. Soooo....I watched like 3,000 bun/top knot/messy bun tutorials! It looked sooo easy but once I had to do it on myself it was a mess!! This was my first attempt--I'll keep trying!!! I feel like I have been wearing my long printed maxi dress to death, so I opted for this short little jersey dress I found on the Target clearance rack for $8! It think it works! 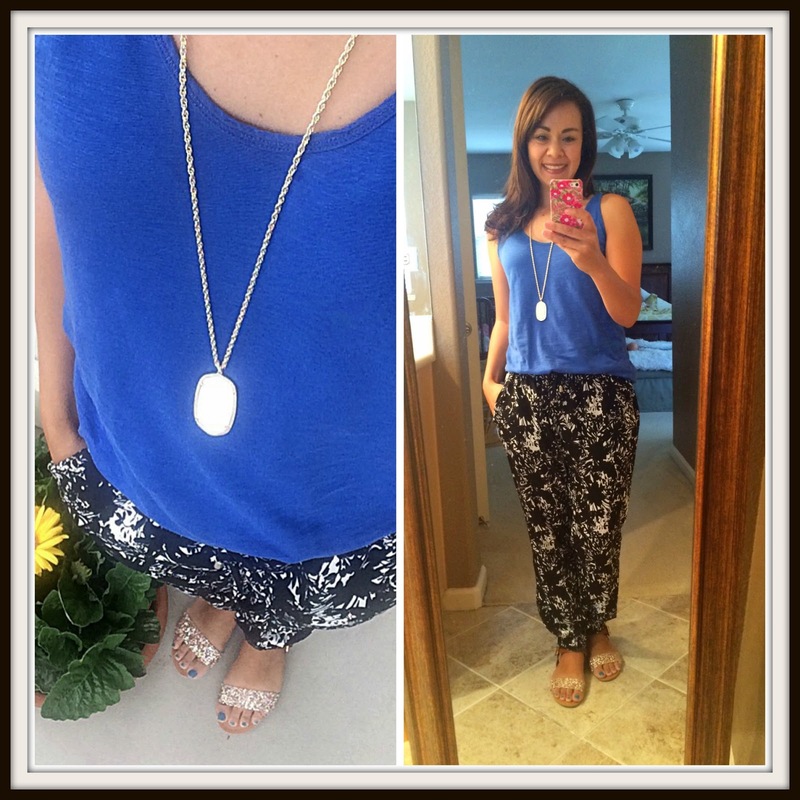 Whatever they are called--I hopped on the Palazzo/Track/Soft pants trend a few months ago and I've never looked back. I LOVE them--totally feels like PJs, yet looks pulled together and not super frumpy. Nothing is more comfy than this outfit!!! You have to shop and be patient for the ones you like, but once you find them, you'll love them! This is one of the outfits I could just live in all summer!!! Like I said, though, I need to invest in some super fun colored Chucks! As a girl of comfort, I can attest that every one of these outfits was super comfy and functional for my everyday, running around mom-life! Next week I'll have 6-7 more outfits for ya! And don't forget, next WEDNESDAY, July 1st Create28 ~ Lovely Summer Looks starts!! Read all about it HERE and join us!!! 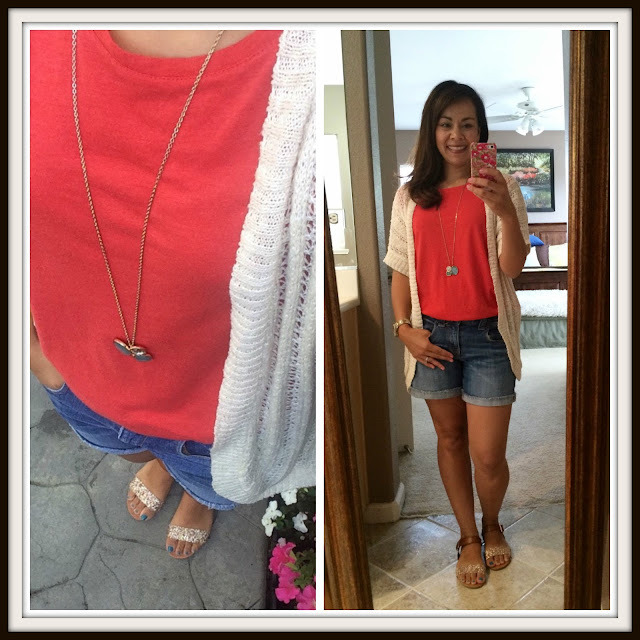 Summer Challenge ~ Week 1 + Giveaway + Linkup!! 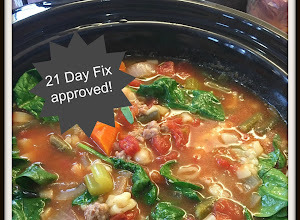 Foodie Friday ~ End of the School Year "Recipe"
Mix it Up ~ Masculine & Feminine + Link Up!